Football is officially over, hockey may never come back, baseball isn't ready to go yet, it's still a month from the tourney, and the NBA, is well, the NBA. All of these statements mean we've reached the dark age of the sports calendar. There's very little going on and the buildup for March 17th and the tip off the ncaa tourney is like the excitement of sean on a fat girl. However, there is one event to divert our attention: The Daytona 500!!! It's the super bowl of racing people. Dale Jarrett has the pole and my boy Jeff Gordon gets inside position on row 2. What does all of this mean?? Other than Fu threatening to "drive to my house and shoot me with a gun" if I made a NASCAR post, it means it's the Great American Race and we should all pay more attention. 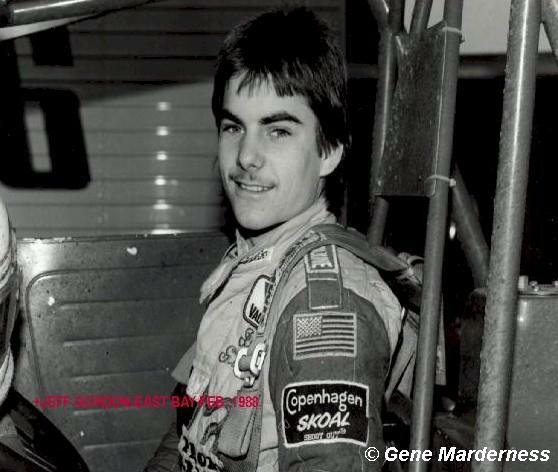 Gordon would have more fans if he brought back the stache and skoal patch. - If they also do game announcing, that doesn't count, only their in studio work. Staring at number five and working down, here we go!! I know that hockey is gone and may never be coming back, but I really enjoy Melrose's work. He's having fun, he seems to know his stuff, and it's a great org-n-i-za-tion. He gets massive bonus points for his sweet mullet. He never stops making fun of people. The NBA is full of moronic characters and somehow Chuck is the only one willing to call them out. If you do something stupid, he'll point it out. He also brings a different viewpoint the the table that no one else has. If you wanna be entertained, he's your guy. Uniform colored suits aside, he's fantastic. He really knows his stuff to breakdown film and give solid insights about the player perspective of the game. There's a whole bunch of former players doing this type of job, and he's the only one that's any good (maybe Steve Young). Well spoken, well calculated responses, and he also laughs at all of Berman's jokes. He is, without question, the greatest studio host of all-time, in the history of the world. A perfect blend of interjection and let corso rant. A synergy of mind and body. Always flawless reasoning and rationale. I love him, and I want to get him some water. The best knowledge of the game of anyone I've ever seen in a studio. It helps that it's the game I understand the best as well so I can really get an appreciation for what he's doing. But he'll show you how the flex cut worked. He'll give you a taste of how to beat a zone. His insight in unmatched in basketball. I feel bad for the other people in the studio with him. He's so superior to their ability, they should just cry. You eat like this Steve Jarvis!!! I'll save my, "oh my god, why are they tv?" for the next post. -The 2004 election could have been halo style: red vs. blue. -I watched Arizona/Providence on classic sports from the 1997 tourney. How did Arizona win that tourney?? They had no post presence. Also, any team with God Shamgod and Austin Croshere should have won. Croshere had a jerri curl, I swear. My exact quotation was "If you post about NASCAR, I will shoot you. Next time I see you, I will have a gun, and I will shoot you with it." And I'm not sure when you last watched a college basketball game on ESPN, but Jay Bilas totally does games now. I know Bilas does games, but I've seen him doing studio work as recent as last week. He can multitask ya know.